Don't see your question here? Email or call me at (662) 231-4817 and I'll be glad to help you! What Are Your Credentials? How Much Experience Do You Have? That's one of the first questions I like to ask before I make a purchase. First of all, I don't consider myself to be any kind of "expert". I'm just a guy who loves making strings, and have been lucky to meet a lot of people and learn a lot about the process over the last 20+ years. I've been making strings for over 20 years now. Not a couple of strings a month--I never have been much for moderation. When I first started, I was making all I could have giving them away for evaluation, trying to get better. Even though I quit counting at 10,000 strings several years ago, I'm still trying to get better--it's a constant learning process. I've made strings for some top rated bowyers and stores, but these days I'm not interested in making strings commercially. I stay plenty busy with custom orders, and I rather work with individuals. I won't sell a string I wouldn't use myself. I am a tournament archer and bow hunter, so I have a good idea what either archer is looking for in a particular string. I don't shoot in as many tournaments as I used to, but I have won and/or placed in tournaments like: The Howard Hill, The Jerry Pierce, Traditional Bowhunter's of GA State Championship, MS State 3D Championship, The TN Classic, the State Games of MS, the ATAR, and several smaller tournaments. I've hunted in Northern Ontario, Canada; New Mexico; Colorado; Georgia; South Carolina; Alabama; and Mississippi...and I hope to keep adding to the list until it's time for me to leave this world. I consider myself very fortunate to know some of the better tournament archers and hunters in the traditional world, along with having close ties to BCY and their wealth of knowledge and test data. I'm constantly asking questions and working to get more information. My friends call me a "string nerd". I've done some of my own "tests", but I don't own precision test equipment that is required to give complete, accurate, and honest numbers. For that, I rely on some folks who do own this equipment. Even though I know I can trust the people I get data from, I strongly encourage people to do their own testing and come to your own conclusions. There are way too many variables in this sport for me to say "this is the best for you, period!" --at least I couldn't say it honestly. I feel it's better to get data from an unbiased source anyway, so I can tell you the facts, not what I want the facts to be. Wait times vary. I'm a one-man operation, and I make every string to order (I don't keep a stock of pre-made strings on hand), so it depends mainly on how far behind I am. Generally speaking, I will have an order shipped within 2 weeks, sometimes less--but sometimes it can take longer. Please don't wait until 3 days before your hunt to place your order. I try to help folks out in an emergency (like a lost or damaged string), but remember the old saying: "A lack of planning on your part does not constitute an emergency on my part." I also have a family. If I have an emergency, family comes first. I don't always have the fastest turn-around, but I try to make your purchase worth the wait. If a custom bow is worth waiting anywhere from a couple of months to a couple of years, the right string to make that bow perform at it's peak should be worth a few weeks. If the wait time is a concern, please contact me for an estimate before you confirm your order. I Was Told That "Strings Are Like Toasters". Is This True? Depends on how you look at it I suppose. Generally something like that is said implying that "a string is a string is a string". In those cases, it's not true at all. Of course not everyone knows enough about archery, and certainly not enough about strings, to understand the differences. Saying that "strings are like toasters" is like saying "bows are like toasters" or "arrows are like toasters" or "archers are like toasters". The right string will go a long way in helping you get the most from your bow. Do you go to the store and buy all your clothes from the "one size fits all" rack? Do you use the same arrow for every bow you own/have owned? Did you buy the first bow you ever saw and stuck with it, regardless of what you use it for, regardless if it's too light or too heavy? If you answered "yes" to all of these, then strings probably are like toasters to you. For the rest of us, not at all. The following will help you choose the right string. If you don't find your answer, feel free to contact me. How Do I Measure For A New String? I make my strings per AMO specs--measured under tension. The best way to measure for a new string is to measure your current string, on the bow, set at the proper brace height. Measure the full length of the string, including the loops. If you can't measure it on the bow, then place one loop on a nail and a pencil in the other loop, apply some tension, and have someone measure it. This will give me the most accurate number to work with. Most any string, even "Fast Flight" type strings, will contract when tension is removed. Dacron strings can contract a LOT, and that throws the measurement off. Can I Order My String By Bow Length? You can, but it's a shot in the dark unless I am familar with your particular bow. AMO states, in a nutshell, that the bow is supposed to be marked as three inches longer than the "string master" (steel cable) that puts it at proper brace. That being said, not every bowyer follows AMO specs, and not everyone likes their bow tuned in that range. The best and most accurate way to order a new string is to measure an existing string per the instructions above. They both work just fine, and I have both on my bows. Each has little advantages, but nothing that will change the game. Generally speaking, flemish is a bit more adjustable and quieter for hunting (to me--some say endless is quieter for them). Endless settles in quicker, may be a little more stable (especially in hot weather), and is easier to duplicate from one maker to the next. What Is The Difference Between Endless And Flemish? Basically the way they are constructed. Flemish strings are made from individual strands with the loops formed by twisting the material ends back into the main string--they resemble a barber's pole. Endless or Continuous Loop strings are generally made with one or two strands of string material, wrapped around a jig several times. The loops are formed by separating the strands and serving. Properly made, there will be little if any difference in performance or durability. Any material can be made into either type string, except Angel Majesty. It was developed for endless strings only. "Bundles" is in referance to Flemish strings and the way they are constructed--using two or three bundles of string material. This can be used on the order form to choose more than one color in an endless string. Some folks feel a three bundle Flemish is superior to a two bundle Flemish. I don't think they are being dishonest when they say that, they just don't know any better. I've seen many "reasons" that three bundles is supposed to be better--here is a list of some of the myths I've encountered. 1. "A three bundle string will have rounder loops" - The loops may (or may not) appear a little rounder...until you put the string on the bow. Bowstring material is pliable, and will flatten out to conform to the shape of the string groove, providing basically the same amount of string contact with the groove with either a two or three bundle. Besides this, I've never known of it being an issue either way. 2. "Three bundles lessens the chance of the loop slipping" - Not if you know how to properly build a string. Actually you can build a really lousy string and the chance of the loop slipping is slim. If the string is that poorly constructed, I really doubt that two or three bundles will matter. 3. "Three bundles makes a rounder string" - Same answer--if you know how to build a string and put the proper back-twist in, two bundles are just as round as three. It's similar to an argument about "how dead is dead?". The string is either round or it is not. 4. "A three bundle is more durable" - I've never seen or been presented with any proof of this--none at all. 5. "A three bundle is just a "better" string" - How? It's not rounder, it's not more durable, it's not quieter...so why would it be "better"? Is there anything wrong with a three bundle? Not at all. I make both, and have shot both. The best tournament archers I personally know shoot two bundle, single color strings. Why? Because there can be subtle differences in one spool of material to the next, or between colors. With a two bundle string, there is less chance of getting a different amount of tension on the bundles. 'Course the large majority of us (myself included) can't shoot well enough to tell the difference, unless the bundle tension is really skewed...but some people can. The only benefit I know of with a three bundle is you can choose three separate colors. A three bundle costs more because it takes longer to build properly compared to a two bundle. I've never been presented with any actual proof that 3 bundles is better. If I thought three bundles was better, or had been presented with any verifiable proof, I'd certainly say so. I know that a two bundle string is a better value for my customers, so I feel obligated to say so. Which Type and Size Serving? I like 62XS, Halo, and Majesty serving. I keep nylon on hand for "old school" folks that ask for it, but it is the least durable and only comes in one size. I have different sizes of serving to accomodate different sizes and types of nocks. Unfortunately there is not an industry standard, and many of them fit differently. If you aren't sure what size serving you need, don't worry. Just make a note of what type nock you use on your arrows and I'll choose the right size for you. I like a light snap. Too loose increases the chance of a dry-fire, too tight and it can interfere with arrow flight and increase noise, especially with lighter draw weights. If you prefer a fit that is looser or tighter, please let me know when you order. Will A "Fast Flight" String Shorten The Life Of My Bow? I'm not a bowyer, and don't claim to be--but I have spoken with a LOT of bowyers, and a LOT of serious archers--archers who have put more arrows through a bow in a typical year of training than most people will in 10-20 years of casual shooting. I've never seen evidence of a bow that was designed for these strings be damaged by them when the string was properly made. 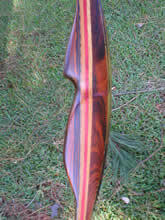 My personal favorite bow is a 66" longbow that I'm pulling 66@30.5" with. I've been shooting this bow for over 15 years, and it's NEVER had a dacron string on it. I've always shot either Dynaflight '97, 8125, 450+, or 8190 on it. I do not shoot light arrows (around 9.5 gpp). I shoot padded loop strings with a moderate strand count (I have tried "skinny" strings on it--don't care for them). I have had a few accidental "dry fires"--she's still going strong. I've been shooting a BCY-X string on a Samick Journey for going on four years, and it's doing just fine as well. Why Is "Bow Type" On the Order Form? I'm asking if you have a longbow or recurve here, so I'll know approximately what size to make your string loops. If you have a bow with larger or smaller than average tips or limbs, please make a note so I can adjust the loop size accordingly. You may send me specific measurements for the loop size if you prefer. What brace height for my bow? The general starting point for recurves is around 8", for the longbows and flatbows around 7". This can vary some from bow to bow and archer to archer--a bit of tinkering may be required to find your personal "sweet spot." Contact your bowyer or manufacturer for specific ranges. What type of string material can I use? Why so many choices? On most new bows, whatever string you prefer, but check with your bowyer or manufacturer to be sure it will not affect the warranty. If your bow is not rated for "Fast Flight" type materials, or you just aren't sure and can't find out, stick with dacron (B-55). I'd never consider telling you what bow, arrows, or your broadheads you have to use--why would I limit you to one or two choices in a string? That is a personal choice. If you aren't sure, I can recommend a material and strand count. I only offer the best in BCY materials--the leader in the industry. What is the difference in string materials? There are three basic types of string material on the market today: Polyester ("dacron"), HMPE or UHMWPE (High Modulous Polyethelene or Ultra High Molecular Weight Polyethelene), and HMPE blends. The type HMPE BCY uses carries the trade name "Dyneema", which is what I'll use from here on out. Polyester is B-55. Safe for any bow, but still has a lot of stretch and creep, especially with a low strand count, heavy draw weight, or in high temperatures. Bows normally transmit more vibration or "hand shock" with polyester, but for some bows it's the only safe choice. B55 is a higher grade polyester than the competition, so you get less stretch, less creep, and better durability. Dynaflight '97 is a 100% Dyneema material (SK-75 Dyneema). It was the benchmark for many years, and is still very popular, but this type material will also creep some in higher temps. BCY-X is BCY's latest offering, and I'm really liking it. It's a blend of 83% SK-90 Dyneema and 17% Vectran. SK-90 is the highest grade of Dyneema available--very strong, very durable. The Vectran makes it even more stable, even in higher temperatures. My experience with it so far has been great--along with better stability and durability, it seems to be quieter on most bows. Can I Expect Amazing Results from Changing Strings? Normally, no. There are no magic bows, no magic arrows, no magic broadheads, no magic strings. If you switch from a very poorly made string to a well made string the results may be amazing, but that's going to extremes. You may notice a difference in durability, noise, hand-shock (vibration), even a slight difference in speed, but nothing supernatural. Strings don't defy the laws of physics, regardless of what you may have read on the internet. They can make your bow a little quieter, have a little less shock, have a little better performance, and be more pleasant over-all to shoot, but don't expect magic. What Is The Best String Material For My Bow? There's really no "right" answer to that question. Ask 2 dozen experienced archers, you may get 2 dozen different answers. It's like asking "what is the best bow" or "what is the best broadhead". What answer you get depends on who you ask. 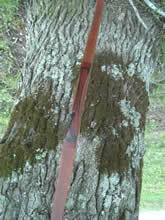 If your bow isn't rated for "Fast Flight" type materials, then choose B-55 (dacron). Other than that, it's a mostly a matter of personal preferance. On a rare occassion some bows seem to "like" one material over another, but generally speaking any of the materials I carry will work just fine. The exception is Angel Majesty--it's a specialty material, made specifically for endless loop string on lighter draw weight bows--primarily target style bows. If you would like to discuss materials more in depth, feel free to call or e-mail me. Do You Have Any "Secret" Techniques? No. If you watch either of my videos, you will see how I make a string. I may change some little something here or there, if I find what I think is a better method, but lets face it...making a string isn't rocket science. There's a ton of science gone into developing some of these materials, but assembling the string is like shooting a bow. You get good instruction, then you practice a LOT at being consistent. I don't rely on hype to sell my strings. I don't have to call them "Nuclear Powered Super-Duper Magic Kryptonian Ultra Strings", or imply top-secret "proprietary" measures taken every other step in the process. Hype sells for a little while. Quality sells, period. I rather focus on quality than a sales pitch. I won't tell you that my strings are going to solve all your shooting woes. You will still have to tune, you will still have to practice. I will give you one of the best foundations to start with, but where you go from there is up to you. You get back what you put into it. Why Do You Only Use BCY Products? Where Can I Learn More About BCY? Those are the easiest questions of all. I only use the best. BCY uses only top-quality fibers from DSM, not cheap imitations from China. Want to see specifically what is used in a BCY product? Go to www.bcyfibers.com and look. No secrets is a big deal to me. You can only have the best finished product if you start with the best raw materials. Why wouldn't you be proud to announce to the world what you use when you only use the best? Don't be fooled by generic names or abbreviations. When you want the best from your local market, do you buy generic or do you buy name brands? Since it's ever-changing, and I don't have their permission, I won't get into specific names. I can say that all of the top compound manufacturers use BCY, especially on their top-end bows. Why mention that? Because they are looking for the same thing we are: Consistency, Durability, Performance, and a Quiet Shot. That side of the sport has much more influence than we do due to sheer numbers--but we still get to reap the benefits. Something else to consider. BCY doesn't have to bribe any of the top shooters to use their material. They use it because it's the best, period.